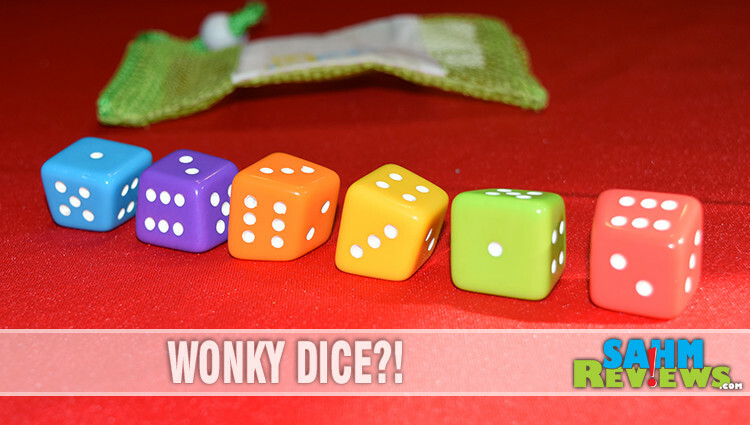 If you asked us what one of our all-time favorite dexterity games we’ve played over the years was, we would both respond with Wonky. It’s so simple, but frustrating at the same time. Trying to stack all those wonky-shaped wooden blocks and having your choice of piece dictated by a random card draw made the game unpredictable and a lot of fun. Three years after featuring it on this site it is still a big seller with newer packaging and an wonderful price point. We hadn’t seen anything similar until recently. 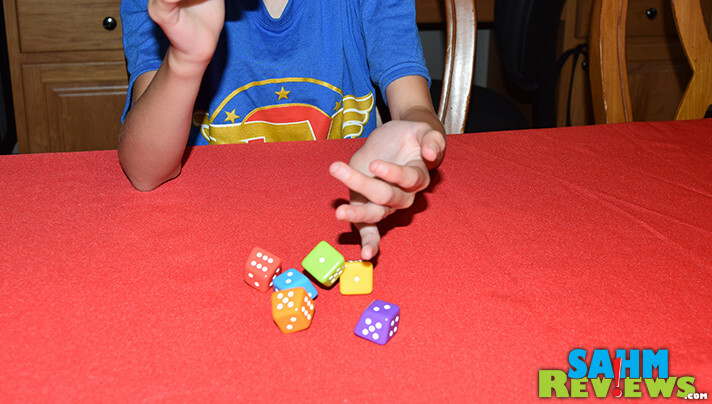 Along with dexterity games, you probably know by now that we love games that include the randomness of dice. What if we could find a title that used both of these mechanics in one package? 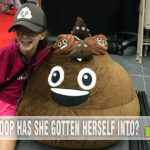 That’s exactly what happened when we came across Dice Stack by Blue Orange Games at a gaming convention! And it’s a game that you can be playing within a minute or two of opening the package, it is that simple to learn and play! 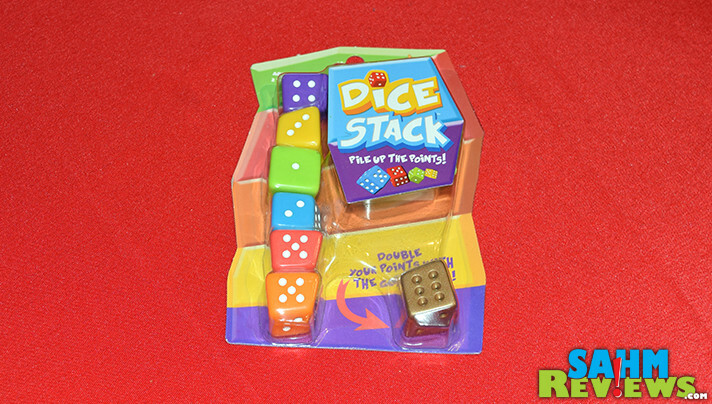 Dice Stack is about challenging you and up to five other friends to stack six wonky-shaped dice in a vertical stack without them falling over. Sounds simple enough, except that you have to also stack them in numerical order, requiring you to place the next die oriented in a different way than the previous. 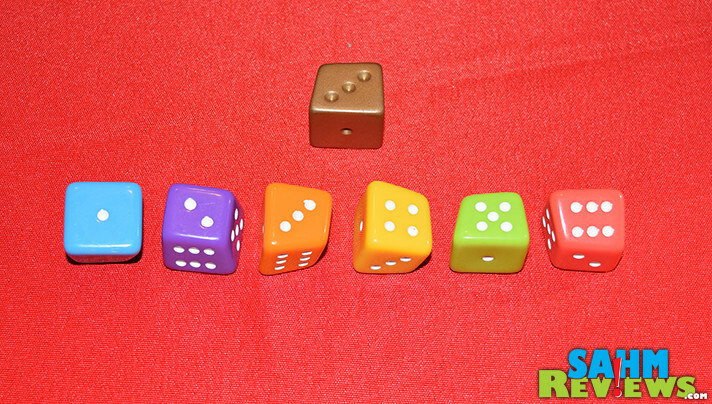 On your turn you will take all six colored dice and roll them. Starting with the lowest valued face, begin building your Dice Stack by stacking the next lowest valued die on top of it. Keep track of the face values you place on the stack, as they will be summed up and added to your score, assuming you create the stack successfully. 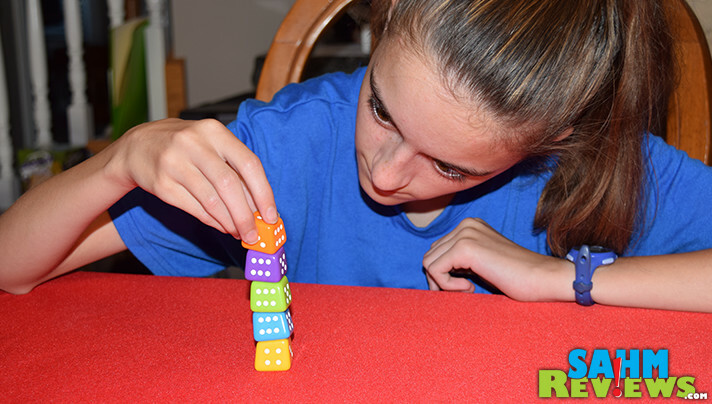 Proceed until either a die (or dice) falls from the stack, netting you a big fat zero for the round, or you elect to stop stacking. In that case you add the total of all faces to your running total. If you forgot to sum up the pips as you went, you are penalized by only receiving one point for each die in your stack and the actual value of your last one. At any time you may stop and also roll the golden die. 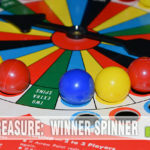 If you successfully place it on top of your stack you will double your round’s score! Of course if it, or any other dice, falls off as a result, you will receive no points for that turn. 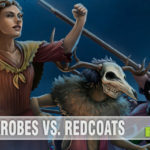 For such a simple game, there are quite a few educational lessons being taught as well. Addition is obvious since you have to sum up the total of the dice faces. Risk vs. reward is present since you have to decide when to stop and when to push your luck and try to stack another die. You’ll also have to consider the angles of each die face that you have to place, hoping two dice sum up to a straight angle (180° for those of you that are geometry-challenged). 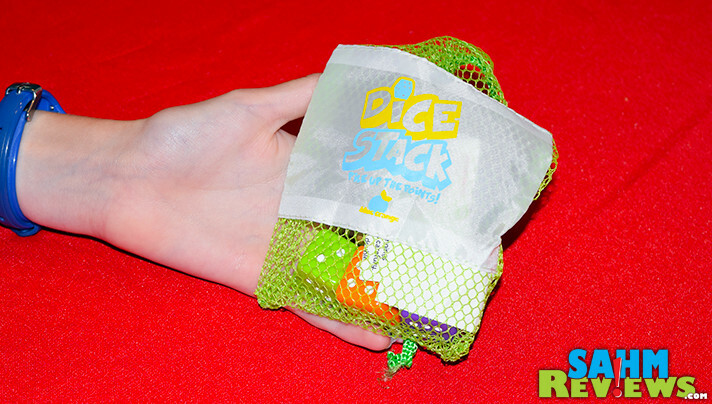 And did I mention that Dice Stack comes with a convenient travel bag? Perfect to throw into a purse or pocket and pull out at a restaurant or family gathering. And at around $10 it’s an easy decision! Roll on over to Blue Orange Games’ website to see what else they’re working on and check out their Facebook and Twitter timelines for all of the latest announcements! How high do you think you could stack these dice? 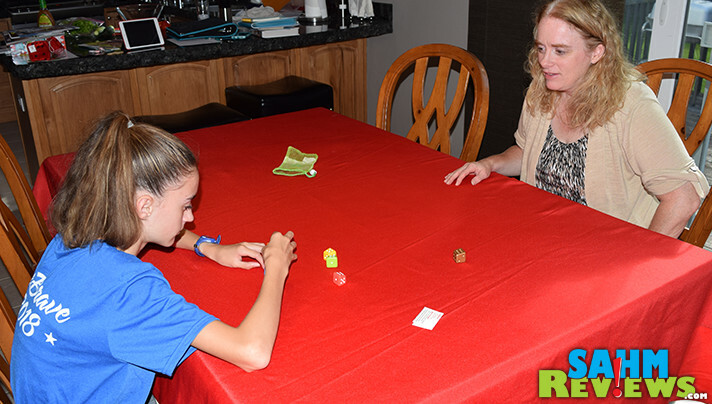 I love finding games the whole family is interested in playing. This looks like a way to get everyone together for laughs and fun. This is so interesting! Simple, yet probably surprisingly difficult. Love this!